Home»News, Blog»ANIMEALS ON WHEELS IS RUNNING LOW ON DRY DOG FOOD. DONATIONS ARE WELCOME! ANIMEALS ON WHEELS IS RUNNING LOW ON DRY DOG FOOD. DONATIONS ARE WELCOME! Tragedy struck a second time in 2017 when Hurricane Harvey flooded his home in a Humble trailer park and he was forced to live in a nearby elementary school until the water subsided. At the school, his beloved Dachshund named Rocky contracted the parvo virus and died. With his home in tatters and his best friend gone, Mr. Wright has worked hard to rebuild his life in a FEMA trailer. 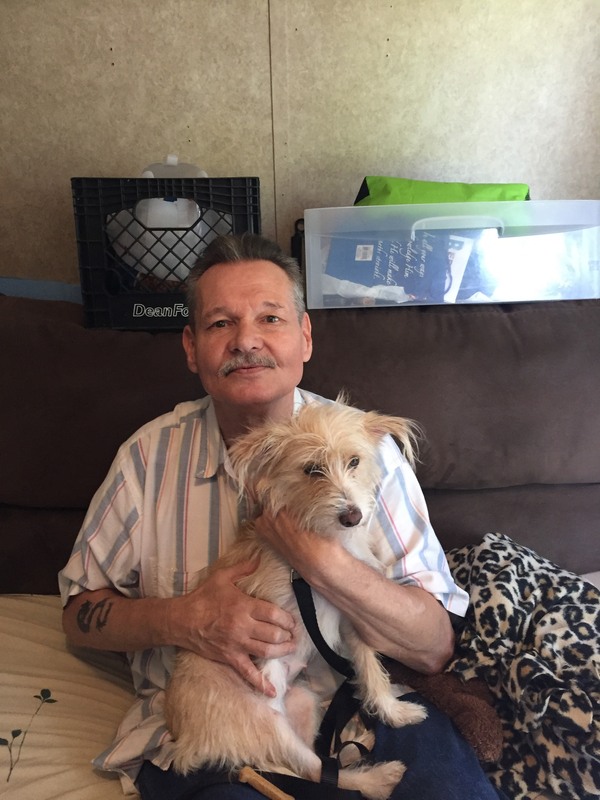 He adopted a Terrier puppy named Mary Lou and enrolled her in the aniMeals program, which delivers dry dog food, treats and toys once a month. Taking advantage of aniMeals’ partnership with the local Emancipet program, Mr. Wright recently had Mary Lou spayed at no charge to help reduce the homeless pet population in his neighborhood. Through a partnership with the Texas Veterinary Medical Foundation, Mary Lou received vaccines as well. Donations can be delivered weekdays at 3202 San Jacinto St., Houston, TX 77004.